A report by Connecticut state auditors revealed a number of instances of wasteful spending in the state employee retirement system amounting to millions in overpayments or payments in violation of state statute. The audit was released Thursday and led to Republican House Leader Themis Klarides, R-Derby, to call for State Comptroller Kevin Lembo to appear before legislators to address the issues raised in the report. The state comptroller’s office administers the pensions and benefits for over 97,000 active and retired state employees. The comptroller’s office disputed a number of the findings in the audit. “So often we hear that ‘there’s no waste in state government’ and ‘we’ve trimmed everything possible,’ yet reports such as this hint otherwise,” Klarides said in a press release. Among some of the findings detailed in the report was the fact that a number of state employees had been rehired following their retirement and worked in excess of the 120 day limit imposed by state statute. Under the terms of a 1989 SEBAC contract and an executive order by Gov. M. Jodi Rell, retired employees can be rehired by the state for no more than 120 day periods, amounting to no more than two years. If the employee remains for more than 120 days they must return any pension payments they received during that time. State law also says these rehired employees are not eligible for overtime, mileage reimbursement, longevity pay or payout for leave accrual. They are also not eligible for health benefits because, as retirees, they are already receiving health coverage. Of the 29 employees tested during the audit, 20 were found to have exceeded the two year period limit and some didn’t leave state service long enough to constitute a true separation of employment. Over the course of 2012 and 2013, the state paid out $867,527 in pension benefits to those employees who worked in excess of the 120 day limit. $19,680 in unused leave time. $27,219 in medical insurance costs. The state agencies paid an additional $59,175 toward the rehired employees retirement benefits. The comptroller’s office noted that it is the individual state agency’s responsibility to monitor and enforce the Temporary Worker Retiree Program. 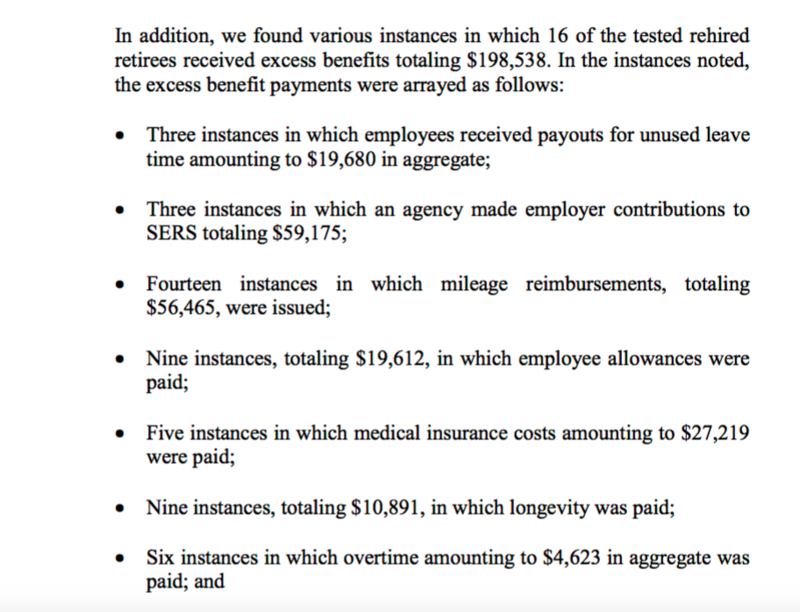 The report also detailed underpayment of retirees, which resulted in interest owed to those former employees in the amount of $2.1 million over 2012, 2013 and 2014. “In effect, the retirement fund is incurring unnecessary interest expenses due to the intentional underpayment of estimated retirement benefits,” the auditors wrote. The state also made payments to retirees in excess of the $210,000 limit imposed by the Internal Revenue Service for employees whose work does not fall under the guidelines of hazardous duty, such as police and firefighters. The auditors said that 170 retirees were classified as hazardous duty retirees but did not meet the criteria and an additional 28 employees who were not classified as hazardous duty retirees were paid in excess of federal limitations. This amounted to $2.2 million in excess payments, according to the audit. Connecticut has a history of paying out pensions in excess of the amount allowed by federal law. The State Employee Retirement Commission has reportedly been working to resolve that issue since 2011. Comptroller Lembo’s office did not immediately return a request for comment.